Adam started his training right here in the Lehigh Valley in the summer of 2006. Adam has extensive experience in teaching children in the Martial Arts, where he holds an Instructor Certification. With an expertise in developing the character of children, Adam uses his passion to inspire and develop others. Adam earned his A.D.A.P.T. Level 2 Parkour Coaching Certification in 2014. He also serves as Director for Parkour Generations Americas. At the age of sixteen years old, Josh started his training in the Spring of 2011 under the leadership of Coach Adam. The following year Coach Adam began providing classes for the next generation of Parkour coaches. Josh and a few others stepped up to the challenge and learned all they could about Parkour. Josh has had the privilege of training with some of the early pioneers of parkour such as Chau Belle, Yann Hnautra and Francois "Forrest" Mahop. Josh earned his A.D.A.P.T. Level 2 Parkour Coaching Certification in 2016. Josh currently instructs at the Lehigh Valley Parkour Academy. Austin began his training at Lehigh Valley Parkour in 2012. With a background in athletics, Austin applies his hard work ethic to his training and continues to develop as a skilled athlete as well as a coach. Austin earned his A.D.A.P.T. Level 2 Parkour Coaching Certification in 2016. Miguel began his training in the Lehigh Valley community as a young man. He was inspired by those around him, and decided to pursue the activity as a personal discipline, as well as a career. Miguel earned his A.D.A.P.T. Level 1 Certification in 2014 and is pursuing his Level 2 while coaching at Lehigh Valley Parkour Academy. Katie started her training in Lancaster in 2013. Since then she has earned her ADAPT Level 1 Coaching Certification, and she is working towards her Level 2. Katie has travelled around the world with her coaching, from workshops in Canada to the Women’s International Parkour Weekend in London. Katie brings a unique and special take from her experiences abroad to our very own classes. Melissa began her Parkour journey at Kutztown University, where she also achieved her degree in Art Education. Melissa completed her ADAPT Level 1 Coaching Certification and is pursuing her Level 2. Melissa has been a coach at the Women’s International Parkour Weekend in London, and regularly coaches locally in Pennsylvania. Melissa loves to bring her passion for art and movement together through parkour coaching. Nate’s coaching career started in New Jersey, where he has lived most of his life. Coach Nate completed his ADAPT Level 1 Course in May of 2017, and has been coaching at an assortment of parkour facilities since. 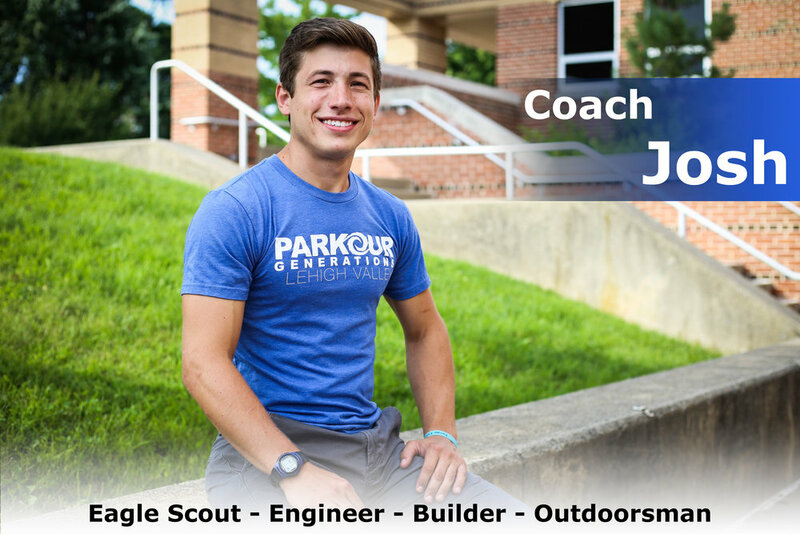 With a passion for coaching kids, and a love for movement and fun, Coach Nate brings a happy spirit to the team and plans to continue his coaching career with Parkour Generations into the future.